Lancaster knows that a beautiful tan is the result of high quality protection. Today we offer our broadest sun protection ever in a new generation formula that combines optimal UVA/UVB protection with new Infrared Technology, to further protect skin Beauty from sun damage. This Satin Sheen Oil contains a new reinforced Tan Activator Complex for an even faster, deeper, flawless tan. An innovative formulation which at last allies tanning pleasure with safe tanning. 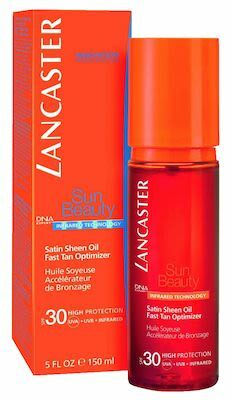 Lancaster Sun legendary scent.